He's reportedly off to Netflix. Activision Blizzard chief financial officer Spencer Neumann’s contract has been terminated, the publisher announced this week. Despite a decline in monthly active users and the drop in shares that accompanied the report, Activision Blizzard says that Neumann’s been fired over a "cause unrelated to the Company’s financial reporting or disclosure controls and procedures." The publisher didn’t specify what the cause was, but Reuters reports that Neumann was poached by Netflix and will be the streaming company’s new CFO. Returning CFO Dennis Durkin, who until recently was chief corporate officer, is taking over. With the share drop, Activision Blizzard is keen to emphasise Durkin’s experience and the company’s growth during his earlier tenure. 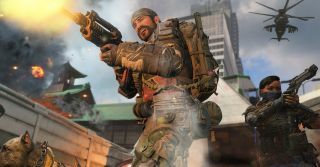 Even with Call of Duty: Black Ops 4’s popularity and the addition of the battle royale mode, Blackout, Activision Blizzard’s games aren’t maintaining the kinds of populations the publisher wants. Destiny 2: Forsaken also didn’t perform as well as it had hoped. Blizzard’s also had a wobbly year. President Mike Morhaime stepped down, BlizzCon was dominated by the poorly-received Diablo Immortal announcement, the Heroes of the Storm team is being scaled back and its tournaments cancelled and, most recently, employees are being paid to leave in the company in an attempt to cut costs.